Birthday surprise at Westwood for young befriender, Nathan. Nathan and his peers from Worksop Priory C of E Primary Academy regularly visits to Westwood residential care home in Worksop to spend time with residents. 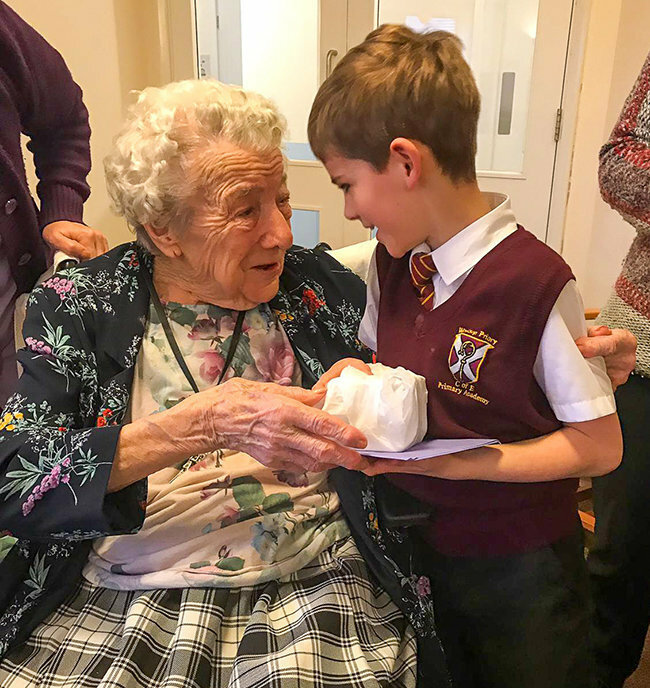 This fantastic intergenerational initiative, which many of our homes support, aims to bridge the generation gap and sees the children and care home residents take part in various activities together, engaging in interesting conversation learning from one another and have formed genuine friendships. Westwood threw a surprise birthday party for Nathan and Betty Hays, a resident at Westwood who is Nathan’s companion, presented Nathan with a surprise gift. A fabulous time was had by all and we look forward to continuing our much-valued connection to Priory School and their wonderful pupils.